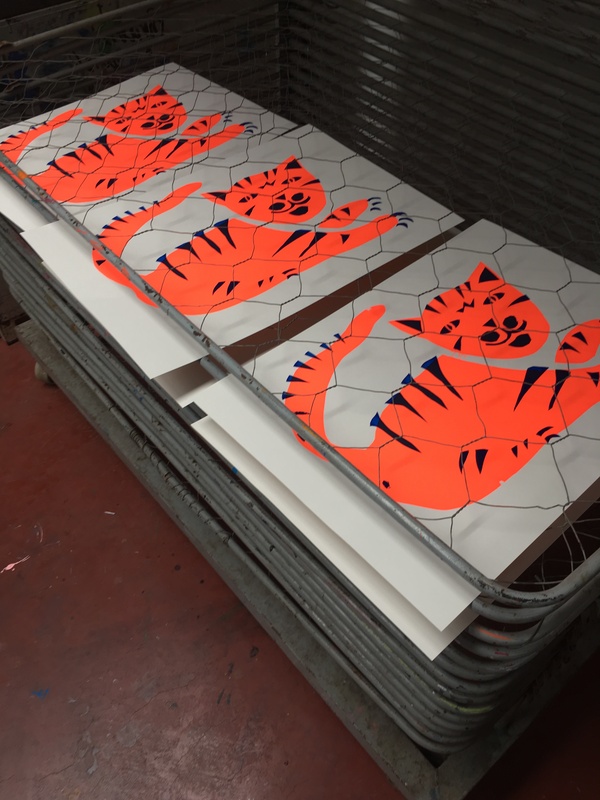 The Beginning Of A Screenprint Love Affair | Fennabee! A few weeks ago I turned 40. And I never felt more energetic and in flow. Why? A lot has to do with the Discovery of Screenprinting. All my illustrating life I’ve always been looking for the most colourful paints and techniques. I thought that Schmincke watercolours was the most bright color (wo)man could get. But when I was about 16 I discovered the old printing techniques: lino, lithography, etching. And then already I loved the smell of the inks, the dirt on my hands when I came home, the physical hard work the printing process is. Screenprinting was in that time the most modern but very time-intensive and very un-ecological way you could print. It didn’t appeal to me then. That is until I took a two day course in a screen print workshop near my house, ‘Gezeever’. And I was instantly smitten! first shirts! woo! these colours on bright white!! Next session? A four colour print of one of my floral patterns off course! Now four color printing, THAT is a lot of work! aaah and then color 4! Fluor pink!!! ← What do I want to do?